If you do not see your question below, then please contact us with your question and we will reply as soon as we can! What size/scale are your miniatures? How can I pay for my items and change quantities? Do you sell items to countries outside the UK? Any legal things I should know about? Everything can be found from hovering along the main menu above. When hovered over, other options will become visible. All items in the menu above can be clicked on to open up the desired page. If the "Miniatures", "Accessories" or the "Information" tabs are hovered over, then more options will be displayed. By clicking the "Miniatures" or "Accessories" button, it will open a page which displays the products in thumbnail form rather than displaying a drop down menu. Most of our images can be clicked on and enlarged. They will either open up in the same screen, or go to another page to show you the zoomed image (This depends on the browser you are using, most should open up in the same page). Some photos require you to hover over them to take a closer look. Our miniatures are sculpted to a 1/60 scale. This means that roughly 5mm is equivalent to 1 foot (1mm being about 2.4inches). Therefore a 30mm miniature is about 6 feet tall (28mm roughly 5'7")and a 45mm miniature is about 9 feet tall. We only accept payments made through PayPal, or by credit/debit card. Credit/debit card payments are processed through Paypal, but you do not need a Paypal account to buy from us. This can be done by clicking the "Add to Cart" button next to the item you wish to purchase. A new window will appear showing you your basket and items within it. This is where you can alter quantities. When you have have finished adding items to your basket, please follow the online instructions which PayPal provide. If you have done this before then you will know that it is a simple and easy way to pay online for your items. Although these minatures may be small, they often weigh more than an average christmas card. Correct packaging is also needed, therefore making it more expensive to send to you. Please allow up to 28 days for delivery (it should not take this long, but it's always good to give something a chance to arrive, especially when buying from overseas). All costs take into account packaging materials, item weight, and time taken to pack./print labels etc. Postage to countries outside of the UK vary depending on the items and amount bought. Please see question below for more information about postage outside of the UK. Do You Sell Items to Countries Outside of the UK? Within the UK: We can supply everything within our site to the UK. Rest of World: The normal postage rates do not always cover all items being sent abroad. So please contact us for a postage estimate. Depending on what you order, it may be covered by normal rates, but please contact us first to make sure you are paying the correct postage. 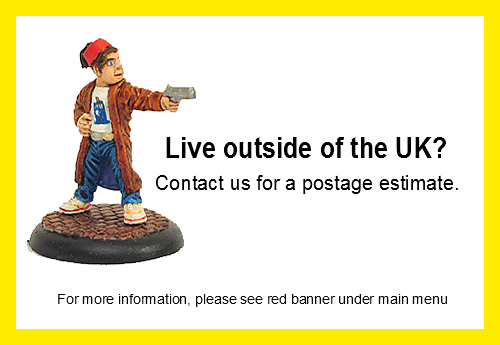 If any items are bought without contacting us first and they are not covered by the normal UK postage rates, then they will not be sent until we have contacted you with an additional postage charge. If you do not agree to the additional postage, then your items will not be sent. This is due to a combination of Paypal being unable to distinguish different countries for postage, and the absoloutly crazy Royal Mail prices. Sorry for any inconvienience this may cause. Some figures may contain lead. So always wash your hands before and after handling! Any adaption or cleaning up of figures resulting in cuts or other injuries is undertaken at your own risk and not the fault of Grekwood Minatures. Any injury or illness sustained as a result of handling or converting our figures is not our fault either. All images and miniatures within this site are copyright of Grekwood Miniatures. We don't mind individuals using our photographs, however, any reproduction of images/artwork/miniatures for commercial gain without our permission is prohibited. If our images are used, then they MUST be credited. Items sculpted are property of Grekwood Minatures and ideas should not be copied. Finally, we reserve the right to change/alter products or prices without advertising first.